Patrick Peebles, Director US-born inventor and technical director of the FanWing project, Pat is self-educated in physics and aeronautics and previously specialised in electronic inventions. He was for some years international area manager for a US-based company before making a full-time commitment to the FanWing. Dikla Peebles, Director Dikla, British, a writer and for many years a teacher, founded the FanWing Company in 1999. Educated at York and Cambridge Universities and with a background of event and project management in both technology and the arts, she is director of PR and principal fundraiser. Gareth Jenkins, Director Formerly administrator and educator in economic theory, policy and development, Gareth was for several years advisor and a US liaison for the FanWing Company. Educated at Swarthmore and Harvard and for many years resident in Europe, he now lives in New Mexico, US. Robert L. Barry, USA Amb. (ret. ); Michael Bednall, Aerospace Consultant; Ross Bradley, former CEO, Strata, Mubadala ; Andrew Chadwick, Business Development Manager, Frazer Nash; Professor JMR Graham (ret. ), Imperial College; Simon Hudson, Director, Tavistock Communications; Dr Ray Kingcombe, Head of Technology, Aerospace and Marine Defence, BIS, UK; Rawle Michelson, MD, Ferghana Partners; Creighton B. Murch, President & Director, Maynard H. Murch Co. Inc; Cmdr Patrick Tyrrell, CEO, Vale Atlantic; Prof. Ir. James Wing Ho Wong, CEO, Allied Science and Technology Limited, Hong Kong. Predicted markets will be in unmanned aircraft (UAVs) for surface or ground-penetrating pipeline, border, urban or other civil surveillance roles, minesweeping, fire-watch, coastal survey, crop spray etc. Subsequent exploitation will be in manned ultralights. Finally, as a quiet, mid-speed, short/vertical take-off-and-landing heavylift manned ‘Sky Truck’ application the FanWing will provide safe and simple short-haul emergency rescue over water and difficult terrain, fire-fighting, and low-emissions low-cost freight and commuter transport. 2013-2015: Joint recipient of European Union FP7 Award for SOAR Consortium Project with DLR, Germany; University of Saarland, Germany; and Von Karman Institute, Belgium. 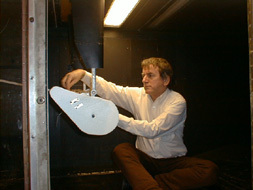 FanWing inventor Pat Peebles won the 2001 InterEx International Experimental Aircraft Award For Best New Propulsion System. In 2003 he won the Edward De Bono ‘Thinking’ Prize in the Saatchi & Saatchi International Awards for ‘World Changing Ideas’. He received award nominations from the Royal Aeronautical Society (2001), and the international World Technology Network for Ideas Most Likely to Influence the Future (2004). The FanWing was selected for the 2004 New York Times Ideas of the Year. Oliver Ahad's Imperial College FanWing Computer Simulation Project Dissertation based on Pat Peebles' FanWing Ultralight designs and specifications won the 2006 Association of Aerospace Universities National John Barnes Award.